View the Dinner Plans, Recipes and Grocery List for this week! then come back to this page to subscribe to receive them free every week! There are subscription dinner planning services that charge a monthly fee for weekly dinner plans. This dinner planning service is different, it's free! I've had friends urge me for years to charge for these plans, but it's just not in my heart to do so. I earn enough through advertising and corporate sponsors as well as my website development and social media business to allow me to continue to provide these menus for no charge. The only payment I'll gladly accept is if you'll tell your friends about this site in person or on social media. 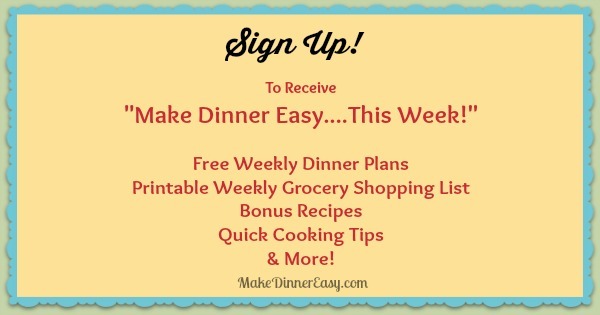 Subscribe to Receive Bonus Recipes and Notification When Weekly Menus Are Posted! Enter your email address below, click the list(s) you'd like to be on and click on "Subscribe"! As a subscriber, you will receive a free e-publication, Make Dinner Easy.... This Week. It's a quick read and will give you seasonal and holiday meal ideas and cooking tips in addition to a link for the weekly dinner plans for that week. I have over 11,000 subscribers and a recent poll I did, those subscribers indicated a very high satisfaction rate with the info they received. Although I usually post the weekly menus plans over the weekend, my readers have told me they like to receive notification of the new plans at the beginning of the week, So I usually send out these newsletters on Monday of each week. If you like what you see on this site, sign up so you don't need to remember to come back and visit! To sign up, just enter your e-mail address in the box above and click Subscribe Please only submit your e-mail address if you are age 16 or older. I will not share or sell your e-mail address to anyone, and will only use it to send you information from Make Dinner Easy. You can unsubscribe at anytime. Each e-mail you receive will contain instructions to stop receiving these e-mails if you wish to in the future. If you subscribed to my weekly newsletter, above, you should be receiving it on the Monday after you have subscribed. and I'd love to have you follow along! come join me at Clear Path Social on Twitter. Each page on this site has a comment box, so if you want to share how a recipe turned out or something you added to make it even better, feel free to comment below! I really love the comments made by people who share their success in the kitchen!